Working with our clients on specialist immersive events makes our blood pump. What’s great about these types of projects is that the only limit is your imagination. Unique, creative and visionary, SLLFX work closely with our clients to produce some of the most individual experiences around. 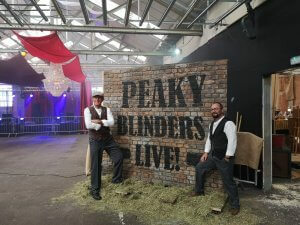 If you’re looking for bespoke set design and installation at an unusual venue and need a team with bags of experience and ideas, you’ve come to the right place. 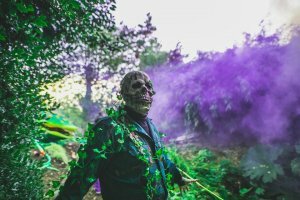 We’ve worked on some incredible bespoke projects, turning warehouses into haunted houses, mansions into jungles and hotels into outer space. The possibilities for bespoke production are endless, and our creative and proactive approach means that working with us will make your experience second to none. Need the use of video mapping to help you turn the front of a building into a Tudor house? Want to make a wall look like a gateway to another dimension? Our video mapping products are out of this world and can create jaw-dropping visual effects. We can also offer pyrotechnics, movement-triggered sound and lighting, backdrops, low lighting, fog and much more! Experience events are all about atmosphere and interaction, let us help you create an event that will leave your audience aghast! We’re also pleased to be working alongside our in-house team Utopia! A team of makeup artists specialising in face and body painting and special FX makeup. The Utopia team are available for hire at any event and are a great addition to immersive experiences in particular. Whether you need your team made up or want to offer your customers the opportunity to be made up at your event, Utopia can tailor a solution to suit your needs. Contact us to discuss your requirements, and let us help you turn your most individual ideas into a reality.